Hidden in the beautiful Norfolk countryside, easily accessible from King’s Lynn and Downham Market, The Red Barn wedding venue has been a place to gather and celebrate over many years. Traditional Norfolk red brick walls surround giant oak timbers which in turn support the cavernous red roof which makes it a beautiful place and an unforgettable wedding venue. A beautiful, historic wedding venue, licensed for civil ceremonies with Norfolk Registars, The Red Barn is available for your entire day from civil ceremony to reception. We also have an alternative site for a marquee reception venue available. Whether you’re considering a traditional wedding or perhaps a theme, this Norfolk barn is a very flexible venue that can be styled to perfection. It may appear old, but there are modern facilities to make the day run smoothly, underfloor heating, various seating arrangements, cloakroom & toilet facilities, power supplies and catering areas. 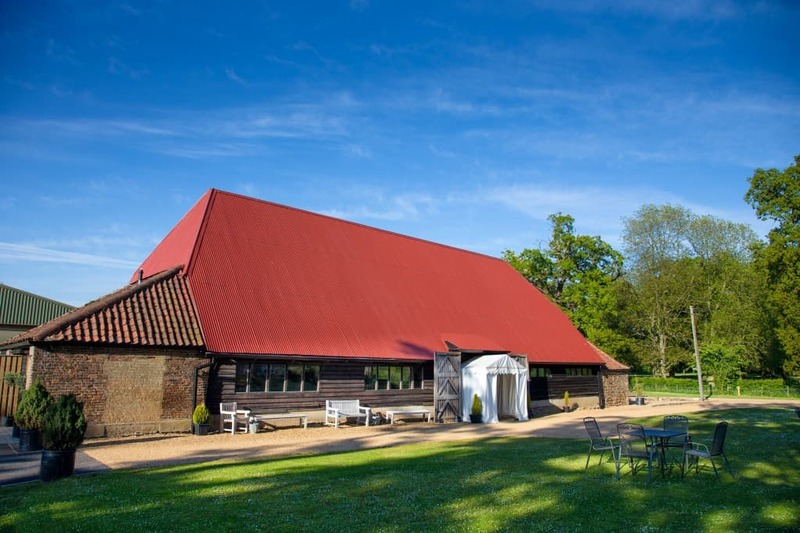 The Red Barn is an approved Norfolk civil marriage and civil partnership venue. In other words we are fully licensed to hold wedding ceremonies which means your entire wedding day, from ceremony to reception, can take place at The Red Barn. You will need to contact the Norfolk County Council Registration Services to arrange a Registrar to officiate at your wedding. There is more information about Getting Married in Norfolk and the links to book your ceremony on the Norfolk County Council website. And although there is obviously a charge made by the Registrar, unlike many other venues, at The Red Barn we do not make any additional charge to hold a wedding ceremony in The Barn. At The Red Barn your wedding can be as unique and enjoyable as you wish by accommodating your personal requirements. We recommend a visit to experience the unique atmosphere of The Red Barn. It also gives you the opportunity to discuss any concerns or ideas you may have. Details can be found on our contact page. We have 4 sample seating plans which you are free to download and use to plan your special event or wedding. We have a great selection of useful links for anybody wishing to plan a Wedding at The Red Barn. From Photography and Catering through to Transport and Cake Designers. We’d love to hear about your plans and ideas.